p2tog is an abbreviation for purl two together. It involves purling two stitches together as though they were one stitch. 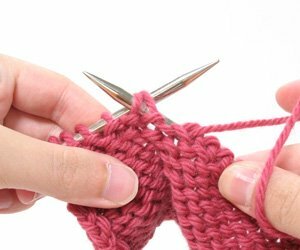 Completing a p2tog creates a decrease in your knitting because where once there were two stitches; there is now only one stitch. This decrease slants to the right. It’s counterpart is the ssp (slip, slip, purl). Insert the right needle through the next two stitches as if to purl. Work them at the same time as for one stitch.